Synchronized two-channel video installation, HD, sound, 8:33 Min. 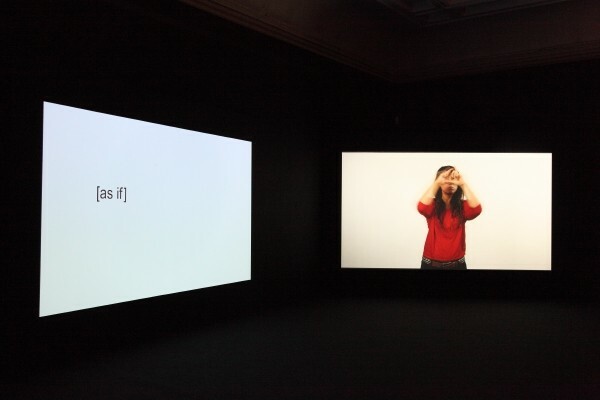 The video installation is a double projection which interlaces texts and text fragments on monochrome colour fields with the lively and individual gestures of two women. Their natural speech is sign language. Through the presence of the two protagonists, their facial expressions and gestures, the eyes begin to see and the written texts link up with what is seen. A direct ascription of gestures to text is, however, deceptive since the signs made by the women are more of a description of their origins, languages and individual experiences than a direct translation of the texts. The installation develops its own grammar, syntax and semantics by linking their personal narrations, with the artist’s texts and fragments from Ludwig Wittgenstein’s philosophical investigations into linguistics in which he compares the structure of language with a continuously changing city. It reveals communication as a process of coming closer and points out that every linguistic understanding inevitably requires reading between the lines of texts, meanings and signs, and that an unequivocal transfer from one language into another is an illusion.